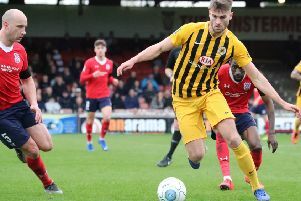 Max Wright reckons his goal at York City will stick with him as one of the best of his career. The 20-year-old may have a bright future in the game ahead of him, but his stunning finish at Bootham Crescent could well take something extra special to be overtaken. Collecting the ball on the left flank, the on-loan Grimsby Town winger spun back inside and hit a curler on the turn which beat Adam Bartlett’s dive and nestled inside the post from 20 yards out. “It’s always nice to score. It’s been a while, Kidderminster away,” said Wright after netting his sixth of the season. “But to score a goal like that from distance, I’m over the moon. “To see how many fans came out to celebrate it as well, you couldn’t wish for more. United return to action at home to Curzon Ashton on Saturday, and Wright is eyeing victory. “We want as many points as possible until the end of the season and this result will set us up nicely for Saturday at home,” he added.